The origin of this delectable confection traces its roots to Central and South America, where the cacao beans were first grown. The native Aztecs in modern-day Mexico and other civilizations in the area drank chocolate mixed with chilies and achiote called “xocotatl” (bitter water) or “chocolatl” (hot water). 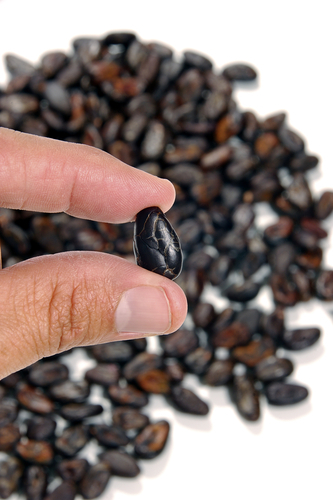 Cacao beans were so valuable among the Aztecs that it was even used as tax payments. It was Christopher Columbus who first brought chocolate to Europe when he explored the Aztec Empire of its riches and introduced the cacao beans to King Ferdinand and Queen Isabella of Spain, but it was the Spanish friars who brought cacao to a broader market. The Spanish conquest of the Aztecs provided the colonizers an opportunity to export cacao beans to Europe, where it became a favorite among royalty and the aristocrats. The first recorded large-scale shipment of chocolate to Europe traveled from Veracruz, Mexico, to Sevilla, Spain, in 1585. The Aztec version of the chocolate drink, however, was instead sweetened with sugar, milk, and vanilla (a spice that was native to Mexico), while removing the chili pepper to suit European tastes. Several European empires, most notably the Spaniards and the French, colonized parts of Africa and turned the land into cacao plantations, using Africans as slaves to help manage them. Because cacao was grown on different soil, the taste quality of chocolate changed, thus becoming a luxury item among the noblemen. Nowadays, Western Africa produces two-thirds of the world’s cocoa, with Côte d´Ivoire growing almost half of it. England got to taste chocolate in the second half of the 17th Century, with its first chocolate house opened in London in 1657. By 1689, noted physician Hans Sloane developed a milk chocolate drink in Jamaica, which was initially used by apothecaries before being sold to John and Benjamin Cadbury, the founders of Cadbury chocolate company. In the 1700s, during the Industrial Revolution, machines were able to squeeze out the cocoa butter from chocolate, creating hard and durable chocolate that became modern chocolate bars. From then on, people from all over appreciate the goodness of chocolate in its solid form.